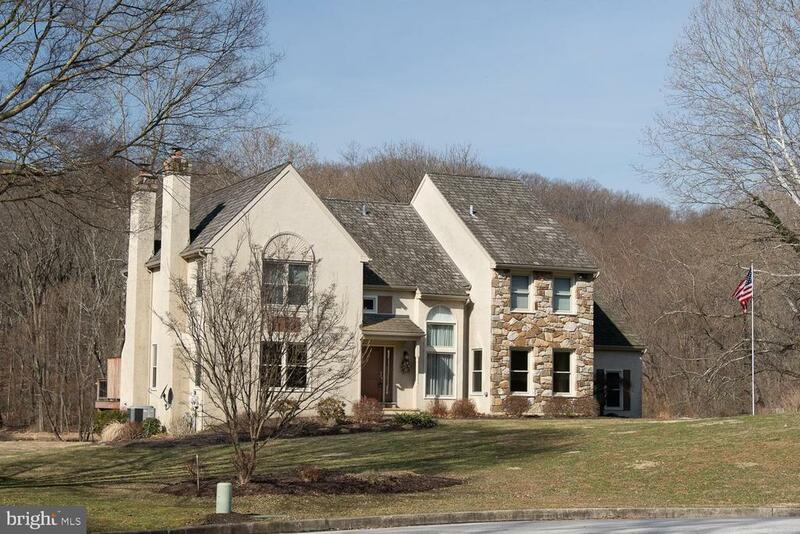 Incredible opportunity to own your own private retreat along Ridley Creek! Located in Rose Tree Media School District just outside of Media Borough, this beautiful home that has been updated throughout and is set on 2.38 acres of lawn, wetlands and creek bed. Sitting high on a knoll the home is designed to capture the gorgeous views from almost every room including the family room, gourmet kitchen, master suite and finished walk-out basement. Enter the front door into the large vaulted foyer with coat closet and nearby powder room, and already the views tantalize you in the distance. To the left is a formal living room with gas fireplace and hardwood floors that run throughout the front of the house. To the right is a pretty dining room with plenty of space for large gatherings. Running the entire length of the back of the home is the open great room comprised of gourmet kitchen, breakfast room and family room. Multiple glass doors from this space lead out to the new gorgeous new Ipe wood deck making this floorplan ideal for entertaining. The kitchen features custom hood, island with counter seating for four and massive quantities of storage in the cabinets and pantry. Off the kitchen is a laundry room/mud room and back hallway with direct access to the two-car attached garage. The kitchen is open to the informal dining area and the sizeable family room with fireplace. All of these spaces capitalize on the beautiful views. Head downstairs to the partially finished basement where a large media/entertainment room, office, powder room and unfinished storage/utility room await. The finished spaces overlook the stunning property and open to a large stone patio. Up on the second floor, the master bedroom suite takes advantage of these same views. The master bathroom has been updated with soaking tub, walk in shower and dual vanities. Down the hall is a full hall bath and three additional large bedrooms with excellent closet space. A special property like this doesnt come to market very often, combining appealing floorplan, exceptional condition and superb location, all on a truly unique piece of land. Nearby are Ridley Creek State Park, Tyler Arboretum and Media Borough with shopping, dining and retail attractions. The home is easily accessible to all major transit including Philadelphia Airport, Rt 476, SEPTA lines, I-95 and Center City Philadelphia. Enjoy your exquisite retreat in the heart of all of that this region has to offer.